ATC launches three-strong range of Special Edition speakers | What Hi-Fi? The new ‘SE’ models are upgraded versions of previous speakers in ATC’s repertoire, and are available in passive and active versions, and complete with a range of new finishes. The three new models are the SCM50SE, SCM100SE and SCM150SE, with each based on their non-SE counterpart. 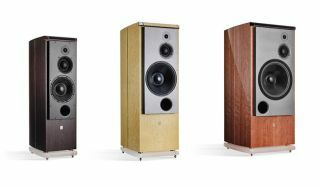 The new speakers are available in a range of limited edition real-wood veneer finishes: Rosewood, Burr Magnolia or High Gloss Cherry, with the ‘top brow’ detailing available in three different colour combinations. Other cosmetic changes for the Special Edition speakers include rear vents and input panels with PVD coating, which claim to be scratch-resistant. The speakers have ‘Special Edition’ etched into them, just in case you forget. Inside the cabinet you’ll find a new three-way arrangement of custom ATC drivers. Each of the three models comes with ATC’s SH25-76S 25mm soft dome, dual-suspension ’S-Spec’ tweeter and the SM75-150S 75mm Super Dome mid-range driver. The bass drivers differ depending on which model you opt for, with 9in, 12in or 15in units on offer. If you choose to go down the active route, then your SE speakers will come with ATC’s top of the range three-way amplifier, while the passive versions benefit from the company's latest crossover designs. Prices are as follows: SCM50SE Passive, £23,671 / Active £26,964, SCM100SE Passive £25,638 / Active £28,921, SCM150SE Passive £31,879 / Active £35,406.